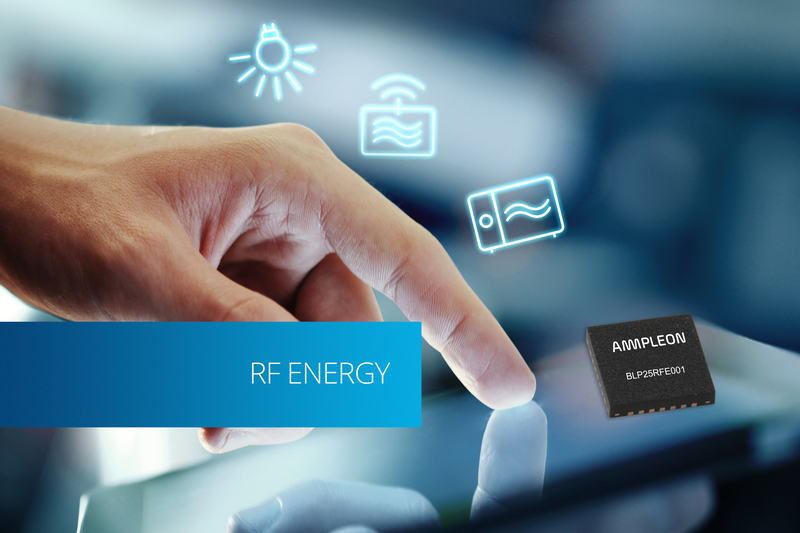 Nijmegen, The Netherlands – April 4, 2018, Ampleon today announced the BLP25RFE001, a small signal generator IC providing a programmable frequency synthesizer able to generate a signal in the 433, 915 and 2,400 MHz ISM bands. This device is designed in particular for a variety of RF energy applications such as industrial heating, defrosting and/or cooking and plasma lighting. Providing an all-in-one solution for RF signal generation and operating from a single 3.3 VDC supply, the IC is assembled in a miniature HVQFN28 and occupies very little PCB space, ideal for use in today’s space-constrained products. The device delivers an output power up to +24 dBm from the on-chip medium power amplifier and is software controllable across a SPI bus. A low power amplifier provides a separate output up to + 7 dBm. The BLP25RF001 incorporates a 360-degree phase shifter that can be programmed in steps of 1.4-degree increments, thus provisioning a high level of system control. Also, daisy chaining of the device allows coherent excitation of multiple RF amplifier chains at different phases and this further contributes to easing system complexity and application development. The signal generation also features a 20 dB gain control, an integrated RF switch for PWM control and a readable temperature sensor that measures the junction temperature of the die.